A family embarks on an annual journey, along with 200 other million peasant workers, to reunite with their distant family. 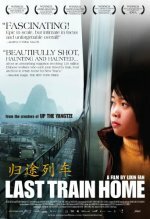 Last Train Home release date was Friday, September 3, 2010. This was a Limited in theaters release.